During LeWeb 11 exhibition, Renault announced the R-Link, a 7″ touchscreen tablet that will equip Renault’s cars starting with the Zoe Electric car and the new Clio (Clio 4) in 2012 for a cost of between 500 to 1000 Euros. The R-Link features a 7″ resistive touchscreen display and comes with steering wheel-mounted controls and speech recognition to make sure the driver keeps an eye on the road. This tablet is said to be running a modified version version of Android 2.2 on a Texas Instruments ARM Cortex A8 processor clocked at 800 Mhz. Renault says the R-Link covers all the car’s functions and data while offering access to a menu of useful and community applications already available on Smartphone such as Tom Tom GPS, Emails, an application finding available parking (Apila), public transport routes (Metro), multimedia applications to play music & video and display picture… At the time of its release, the R-Link is expected to pack more than 50 applications, and more application will be available via the R-Link Store. You’ll also be able to make phone calls (as shown in the video below) via voice recognition or by using the steering wheel controls to select contacts. If you have the Zoe Electric car, you’ll be able to control the charging times (to charge during off-peak time) and view the battery status. Whether you use the electric car or a car based on internal combustion engine, there is an “Eco Challenge” application that will tell you how “green” if you driving style and what you can do to improve it. If you are young software development company, you can submit your proposal to develop an application for Renault’s Connected Mobility by January 31st 2012. You’ll need to be able to read French, as the form is only available in that language. Renault plan to support selected start-ups both financially and technically. I think this is only open to companies around Paris, but you could probably contact them at mobiliteconnectee [at] parisincubateurs.com if you want to make sure. 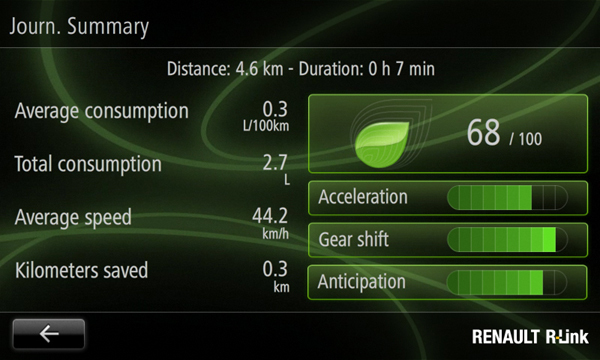 Further information can be found at Renault’s R-Link product page. If you can understand French, I also recommend you watch the 15-minutes video interview /demo on frandroid.